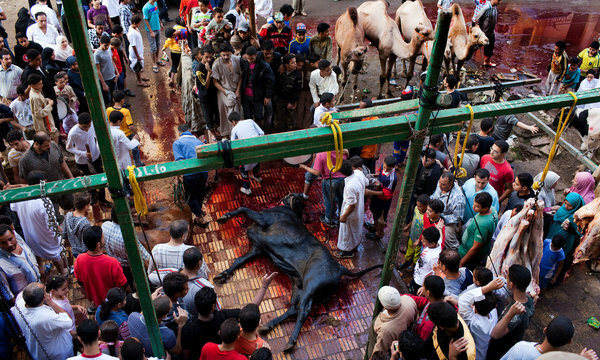 At the Basateen slaughterhouse, near the vast cemetery known as the City of the Dead, butchers stride about in knee-high rubber boots, surrounded by lakes of feces, blood and urine. It was here that [an] Australian reporter documented animal abuses in 2006. I know I was shocked to learn that in a slaughterhouse located in the City of the Dead — amid butchers wading through lakes of feces, blood, and urine — some animal abuses were committed. Shocked, I tell you. I guess we’re both sitting at our computers this Sunday night. Just saw the same article. At least there is coverage, with, perhaps, some people being turned off to the practice.